Not long after it had given a go-ahead for development and production of the Saab-32, the Swedish air force began to draw up its specification for a new single-seat fighter that would be able to intercept bombers flying in the transonic speed range. The new type was obviously going to need supersonic speed capability (at a time when only the Bell X-1 research aircraft was able to demonstrate such performance), an unprecedented rate of climb, above, average range and endurance, and a considerable weapon load. To 'add icing to the cake', it was required to have STOL (short take-off and landing) characteristics to allow for its deployment from a variety of dispersed sites. The first of the prototypes was flown on 25 October 1955, the other two in early 1956, all three of them powered by Rolls-Royce Avon turbojets with afterburners. The type was ordered into production during 1956, and the first series-built J 35A Draken (dragon) was flown on 15 February 1958, this being powered by a Flygmotor RM6B turbojet, a licence-built version of the Rolls-Royce Avon. Entry into service began in March 1960, initially with Flygflottilj 13 at Norrkoping, and production for the Flygvapen totalled approximately 525 aircraft in all versions. Sixty J 35J and 12 Sk 35C two-seat trainers remain in service with F10's four squadrons at Angelholm, in southern Sweden. Serving as pure interceptors, the J 35J 'Johanns' will be retained until 1995 at least. Saab also developed the Draken for export, under the designation Saab-35X, with increased fuel capacity and a higher gross weight to allow the carriage of heavier external loads. The first customer was Denmark, receiving aircraft known as the A 35XD (similar to the Swedish J 35F), but becoming the F-35 once in service with the Kongelige Danske Flyvevabnet (Danish air force). The RF 35 (Saab S 35XD) is a variant of the Swedish S 35E photo-reconnaissance Draken, no longer in service. Eventually 11 Sk 35XD (TF-35) two-seat trainers were also delivered. Denmark's last Draken squadron, operating all three versions of the aircraft, is slated for disbandment at the end of 1993. The second export customer was Finland which received 12 J 35XS (Swedish J 35F-2) fighters, five J 35CS (Swedish Sk 35C) trainers and finally 24 J 35FS zero-timed ex-Flygvapnet J 35F single-seaters. A single unit, 'Lapland Wing', flies the aircraft today. Austria became the fourth Draken operator with the delivery of its aircraft in the mid-1980s. Twenty-three J 35Os (Swedish J 35Ds) serve as the nation's primary air defence fighter. 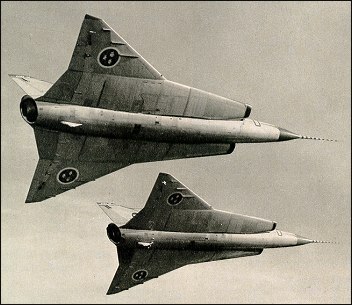 Now virtually replaced in Swedish service by the Saab 37 Viggen, a total of 606 Drakens was built. Saab achievement in building Europe's first supersonic combat aircraft (and one capable of Mach 2 at that) remains undiminished, with only governmental restrictions impeding wider sales. I have a generator off of on of these if anyone is interested. one error in data though, the -35 only had 2 Aden 30mm guns on in each wingroot outboard of the intakes, later models only carried one gun. Whilst the cranked delta was a clever and novel wing design I somehow do not think that this was the initiator of the "Ogee" planform of the Concorde wing. Leo you really do not like the Lightning do you? Correction to the date I worked on it. Naturally it was supposed to be much earlier, 1985/86. Blame it on not enough coffee this morning! I had the distinct honor of working on these beautiful planes back in 2005/06 while serving in the Danish Airforce, and I have quite the stories about them. This type of plane is as solid as they come, and during their distinct service with the Danish Airforce not a single plane was lost due to incidents or accidents (it came close). On one instance during a photo rec mission in the Baltic sea, a pilot got a little close to the water while cranking it around for a better picture of a Russian trawler, and dipped the wing in the drink. The drag pulled the outmost section (the double delta part) off, but he recovered and flew home. Try that in just about any other plane! One very important feature hardly ever mentioned is the ability to start the plane without aux power unit. In a time and age where just about all jet powered planes needed a boost to get going, the pilots of the F35 simply turned the key and pushed the starter button. It was a combination of electric starter and a very foul smelling chemical that was shot through the engine under pressure. Never stand down wind from a starting F35, I found out the hard way. This is foul smelling and burns your eyes! This was a wonderful plane both to look at, to work on and according to the pilots a fun thing to fly! When I was on summer camp with the RSwAF Air Cadets at F10 in 1984, the Lt who was in charge of us told that on the first week of field maneuvres every 35 was opposed by two or three 37s, the second week the strenghts were about even and in the third week only the 35s flew. Of course his statement could have been biased by the fact that by this time F10 in �ngelholm was the only wing still operating the 35. Yes, it's a remarceble aircraft that's so beautiful! Remember when I was a kid and skating next to the military airport, and 20-30 Draken came in for landing just 15 meters over our head. You have to cover your ears while the whole body was shaken by the thunder... It happend every weekend in the age when Sweden still have a military strength. Draken flies like a spear, and turn like a spear. So compared with Viggen and Gripen (Griffin) it have no chance! Gripen turns twice as fast as Draken, so I understand that it belongs to the past.... Still beautiful though! This magnificent aircraft should end all the stupid jokes about "dumb Swedes". With it's tremendous performance in all areas, one wonders why there was any need to replace it! Equipped with modern power, fire-control systems & avionics, it could probably hold it's own with the best of them! It just goes to show what can be done with the will (I know you have to have enough money too!). And for Sweden to do this in a short space of time. Of course the UK had the Lightning, France the Mirage, and rather oddly the USA had numerous failures until the great Phantom II, but it seems the Draken got it right - speed, fair range, armament (9,000 LBS load). after using a British engine, we here in the UK had no excuse, though our post war austerity still showed we had drive, but that turd Duncan Sandys with almost one stroke nearly destroyed our wonderful aero industry. With a wing planforn that spawned Concorde, the draken was a real piece of work. Compared to RAF aircraft of the period, Sweden could have fought the second Battle of Britain and won. Later, when Lightning came out powered by twice the engines, it didn't have the range to protect the coast. politicians hiring accountants to buy an air force gets you useless garbage, expensive garbage. When an RWR makes a noise, check your six, Thomas. All the Swedish aircrafts are the best all over the world!!! The F-16, the Phantoms, the Eurofighters they are all B U L L S H I T S ! ! ! Thailand is successfully made this draken in paper models. There are hundred of paper models that been made and ready for kids. An excellent aircraft, one of my favourites, and for a country like Sweden, who had not previously had the mass of experience the WWII allies had in jets they surprised us all. Right through to the great Gripen, they put a lot of our politicians who pussyfoot over cost, yet claim to be big nations to shame - the Swedes do it right! The danged thing flew 0nly 10 years after WWII!! !....BRILLIANT!